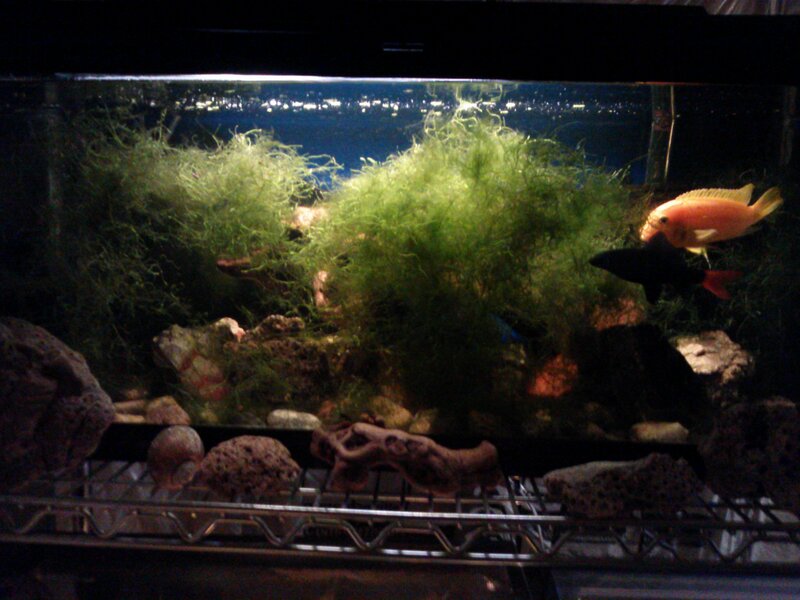 Let’s start with this 30 gallon tank filled with very active fish. Zebra Danios, Odessa Barbs, Tiger Barbs, an Opaline Gourami, Harlequin Rasboras and 3 Kuhli Loaches hiding under the rocks. 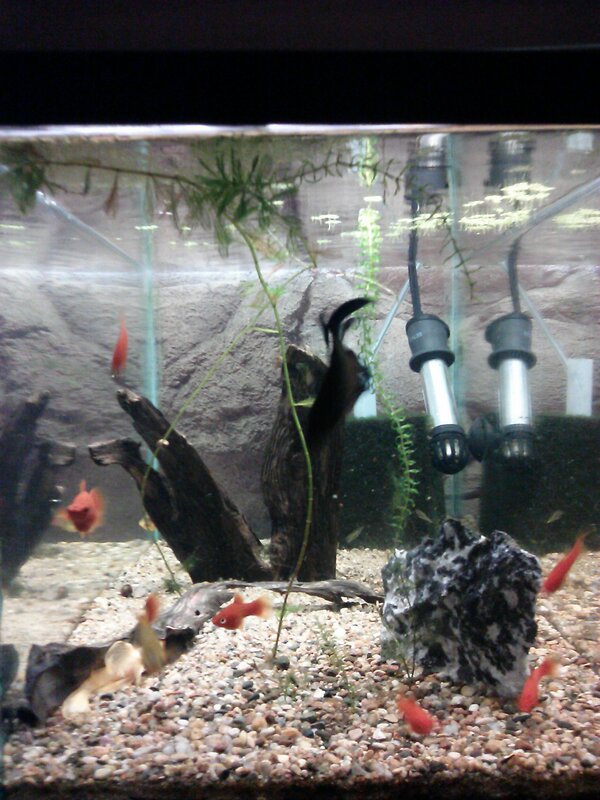 Here’s a little 10-gallon tank with young Red Swordtails and a Betta. Since I took this picture I have added 3 Marigold Variatus Platies and some more plants. 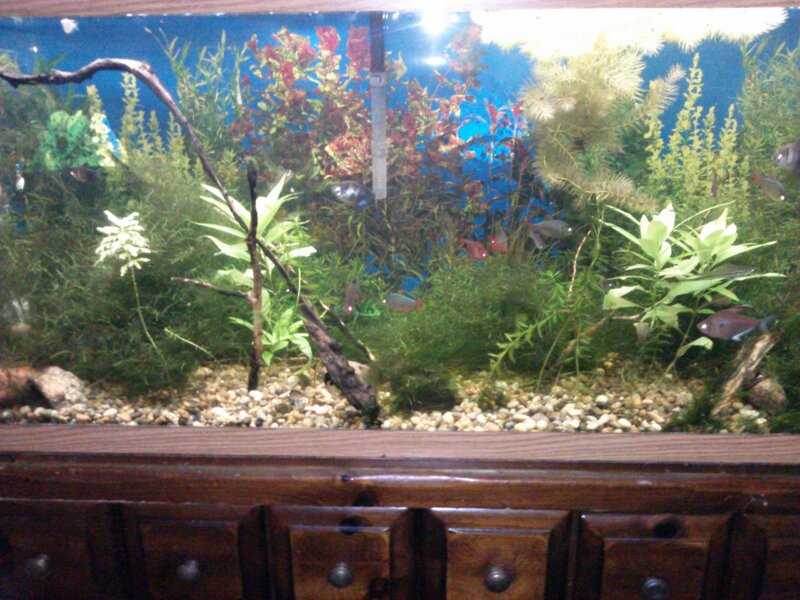 Here’s another 10-gallon tank with Silver Mollies and Endler’s Livebearers. Lots of baby fish are starting to show up. 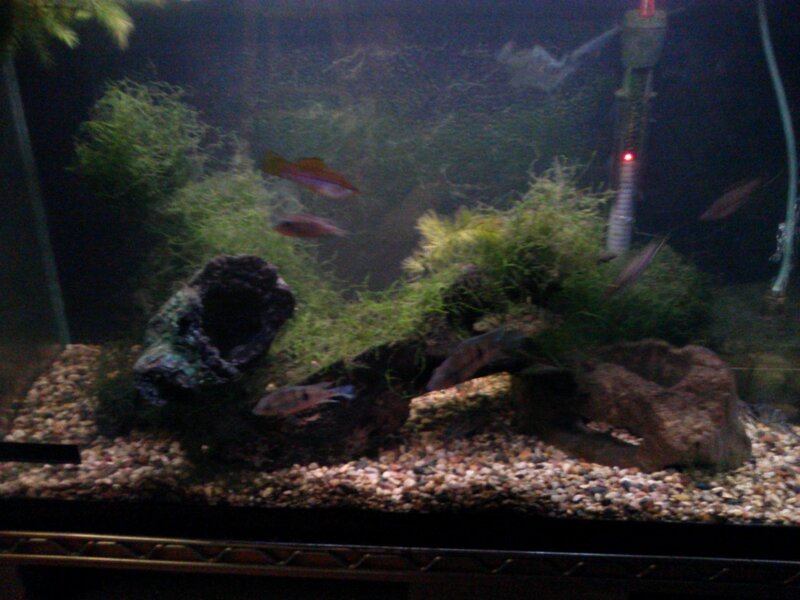 I moved my 3 Pictus catfish into this 29-gallon tank with 3 green Swordtails and my Firemouth Cichlids. In real life this tank looks very nice and I get to see the Pictus Cats a lot more than I did in their previous tank. When I found the 6-inch Bullhead in the turtle pond I had intended to release him in a nearby creek but instead I put him in the tank with the “bad boys”, the African Cichlid and big Red-tail Shark. The Bullhead just goes about his business, big mouth gulping and gaping as he cruises along. The Cichlid and Shark ignore him. Now the Bullhead has found a place to sleep during the day and I don’t expect to see him too often. 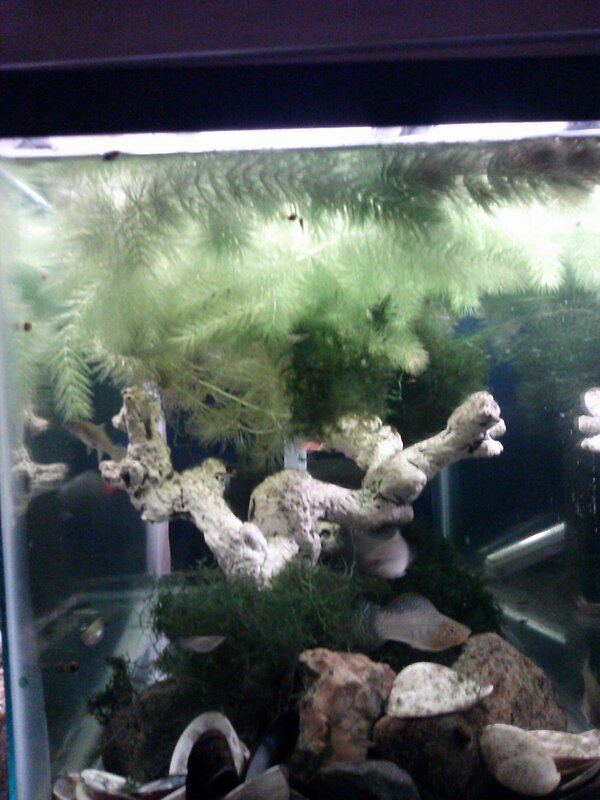 This tank is crowded with rocks, wood, and plants (Java Moss). The Bullhead is in here but he’s hiding. Here’s the 55-gallon community tank with mostly large Tetras, Angelfish, and Corydoras. Odessa Barbs are one of the prettiest fish you will ever see. The males are spectacular. At the pet shop they look pale, boring, mostly silvery gray and a little reddish. Buy some, wait a few days and WOW, they turn into one of the most amazing freshwater fish you can get. 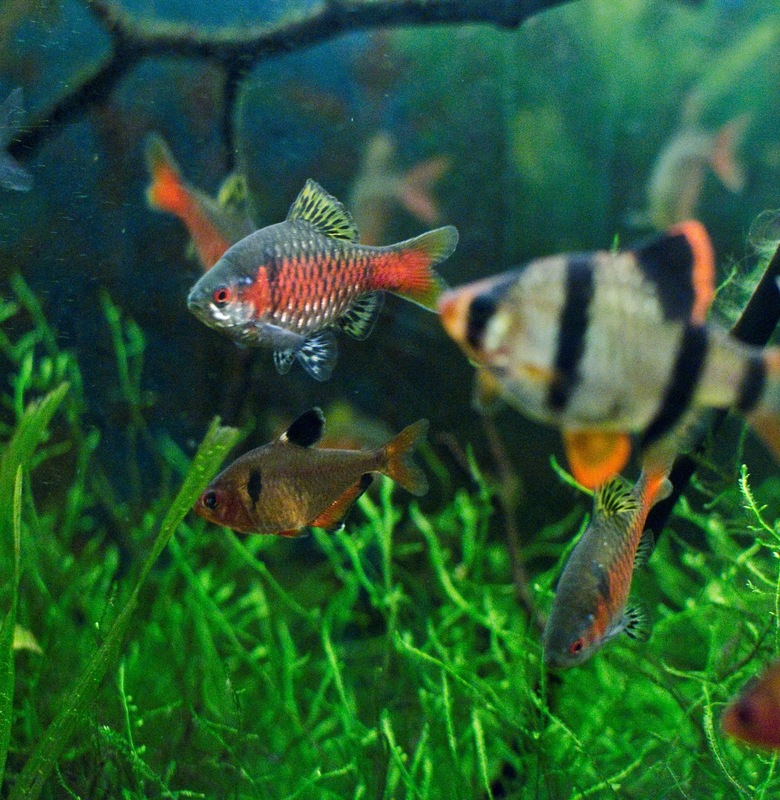 This also happens with Rummy-nose Tetras…dull at the pet shop, beautiful in your tank. Female Odessa’s do not have the brilliant colors of the males, and when I bought my Odessas I hoped I had a female or two, they all looked so plain. But all of them were males!! In a few days they were flying around the tank, establishing a pecking order. They were soooo fast and seemed so powerful that I was afraid for the other fish in the tank. But the Odessa’s only chased each other, and if one was beaten, he hid awhile and came out later looking as good as new. I think they need some room to swim fast and chase each other. A 20 gallon would be good for a small group. Live plants are nice for them to hide in. I did find a female Odessa Barb, but since I already had 5 males, I eventually felt sorry for her and put her in a 10 gallon for some peace and quiet. I theorize that the Odessas are so strong and healthy because they have only been captive-bred for about 30 years or so. There were no Odessa Barbs to be bought when I had fish in the late 1970’s. They just seem like you plucked them right out of an Asian stream, feisty as heck. That’s the word for these guys, feisty, in a good way. If you acquire some, get up close to the tank and just stare at them , you will see colors and patterns that are not apparent from a distance. Three Odessa Barbs in this photo.